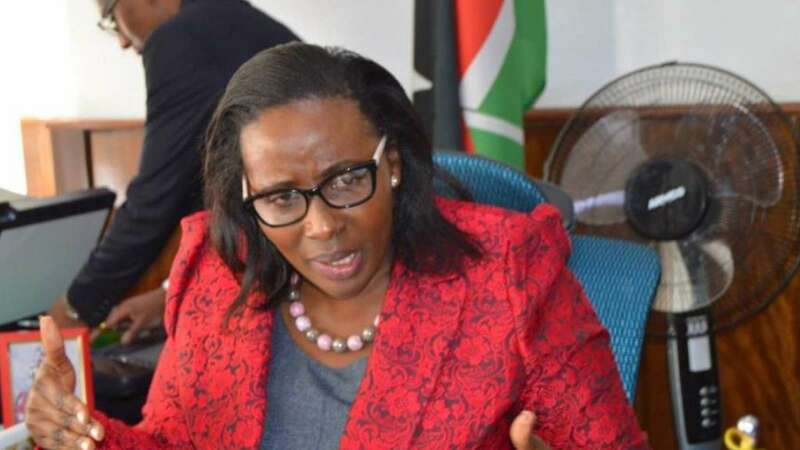 Nairobi County Assembly representatives laid a clear case of fraud, misuse of power and outright corruption to impeach their speaker Beatrice Elachi. 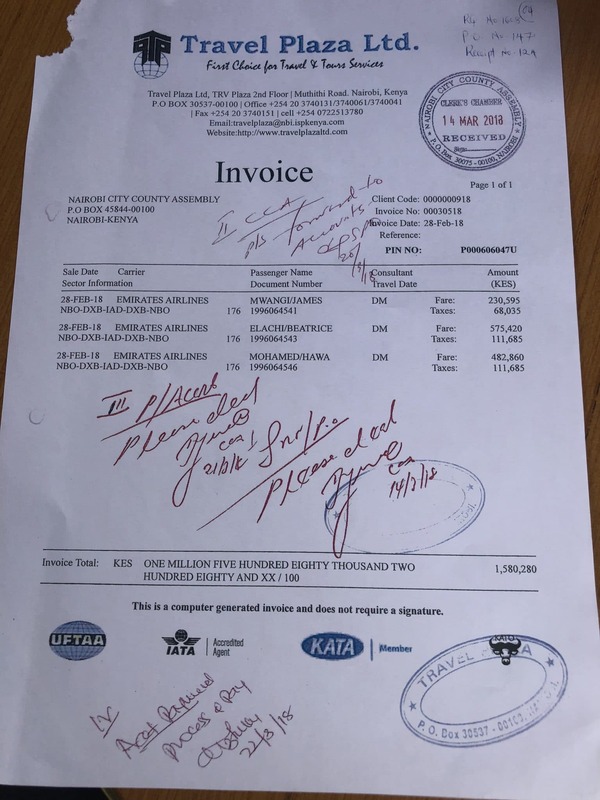 In the well documented case with provided evidence, it was found that the speaker started demanding to use first class and not business class as provided for in the regulations published by Salaries and Remuneration Commission (SRC). 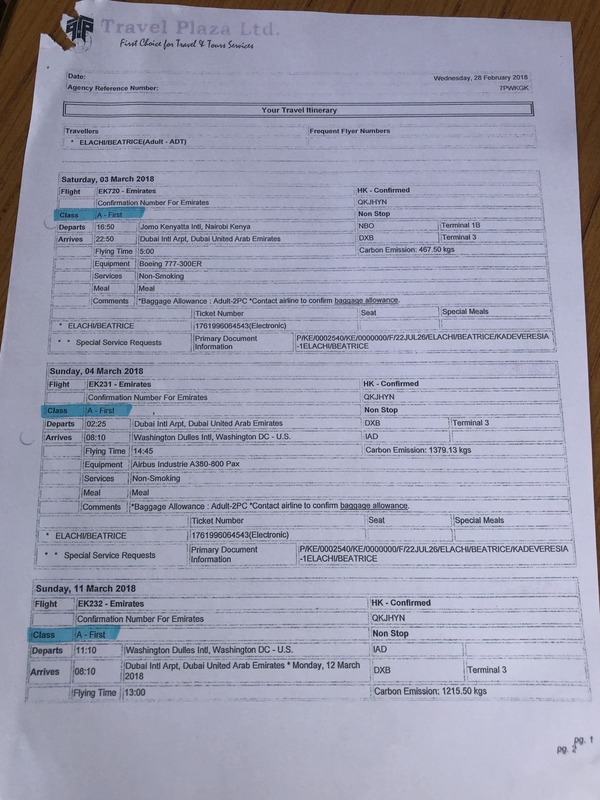 We have evidence of the speaker calling a travel agent, Travel Plaza Ltd, to demand that they book her on first class of Emirates Airlines which cost Ksh1.6 million against the SRC regulations which allows her to fly only on business class and below. 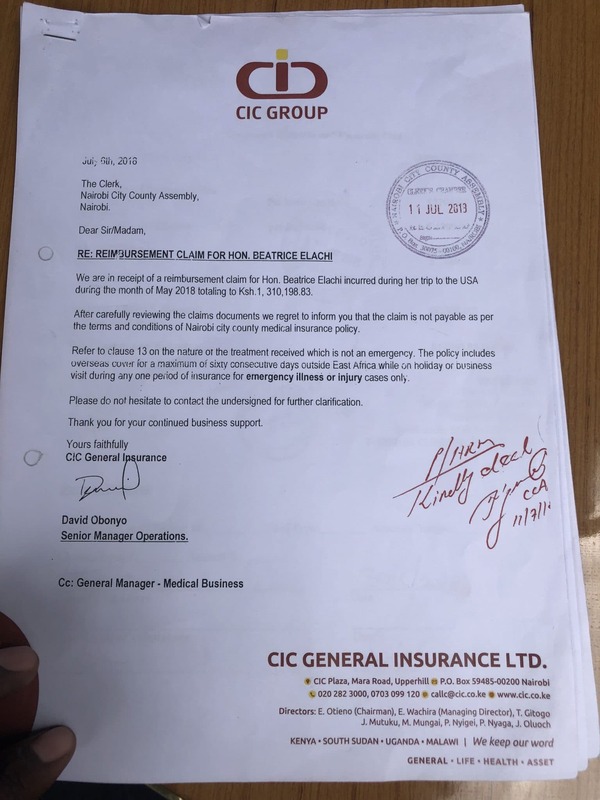 Apart from the above, Speaker Beatrice Elachi also sought the services of a plastic surgeon in USA and demanded that the insurance company covering the county assembly staff and members, CIC Insurance, pay the Ksh1.3 million she spent in it. 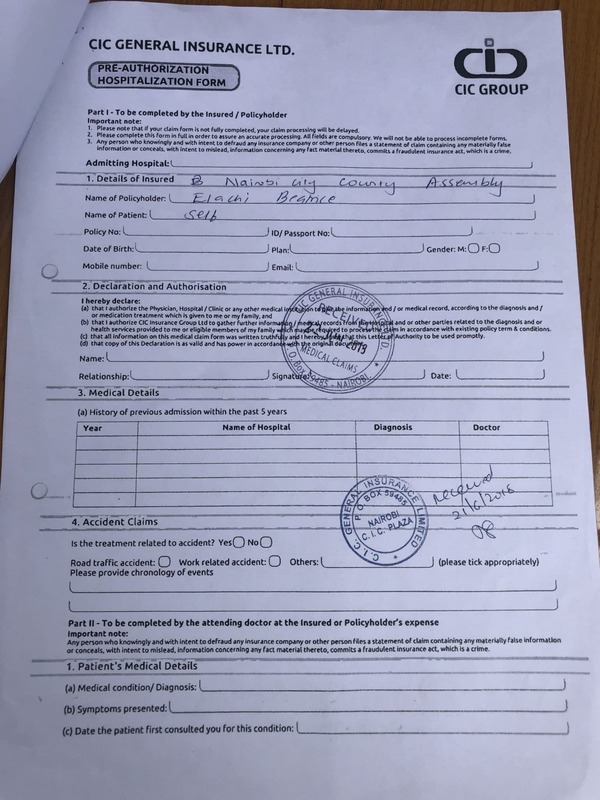 To mask her travel to USA for plastic surgery in May 2018, Speaker Elachi forged the invitation letter of non-existent organisation, Diaspora Women Network which the county assembly clerk’s office approved without authenticating. The real organisation with a similar name to the one which invited the speaker is Diaspora African Women’s Network (DAWN) and not the stated Diaspora Women’s Network. 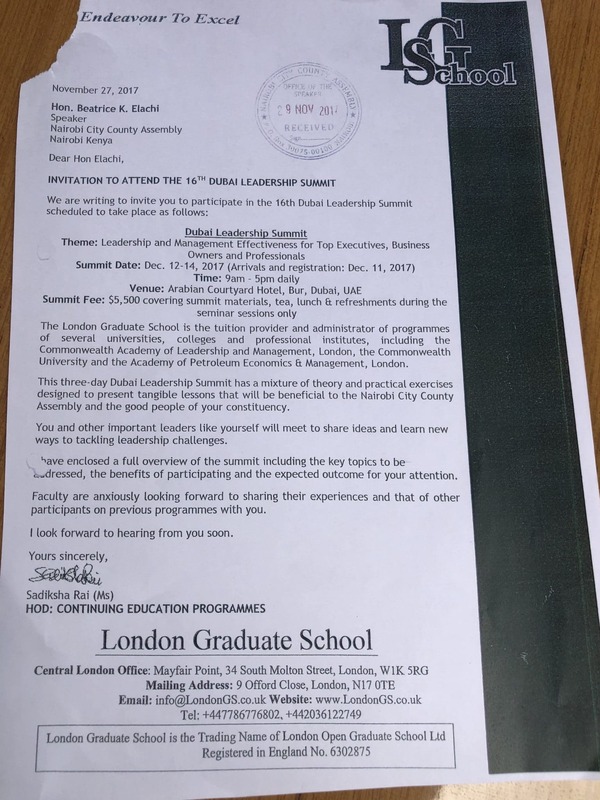 Coupled with the above, the recently deposed speaker Beatrice Elachi bought a honorary degree from a non-existent Commonwealth University and now demands that she be called Dr Beatrice Elachi. 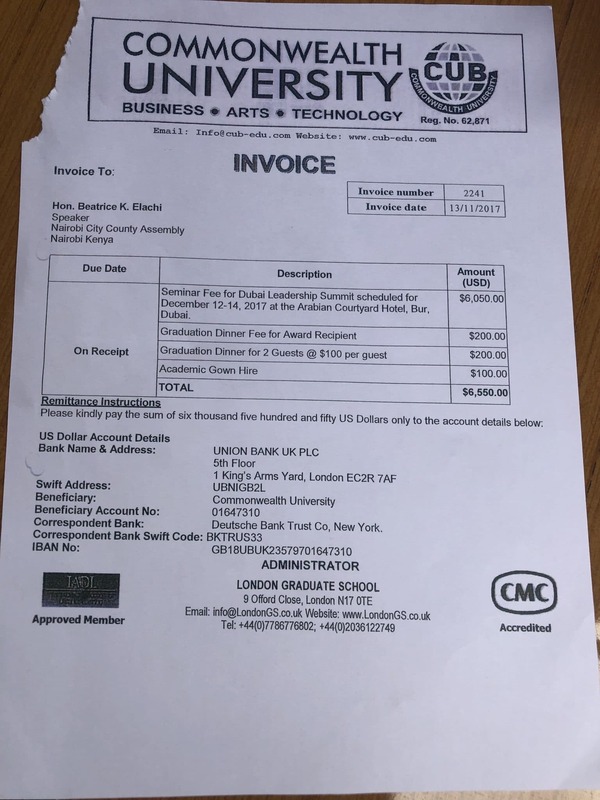 Evidence in our possession clearly show that Speaker Beatrice Elachi bought the degree at Ksh655,000 which the Commonwealth University listed as award “summit fees.” Beatrice Elachi was awarded the fake honorary degree by the degree mill which is believed to be operated by Nigerians based in Uganda. 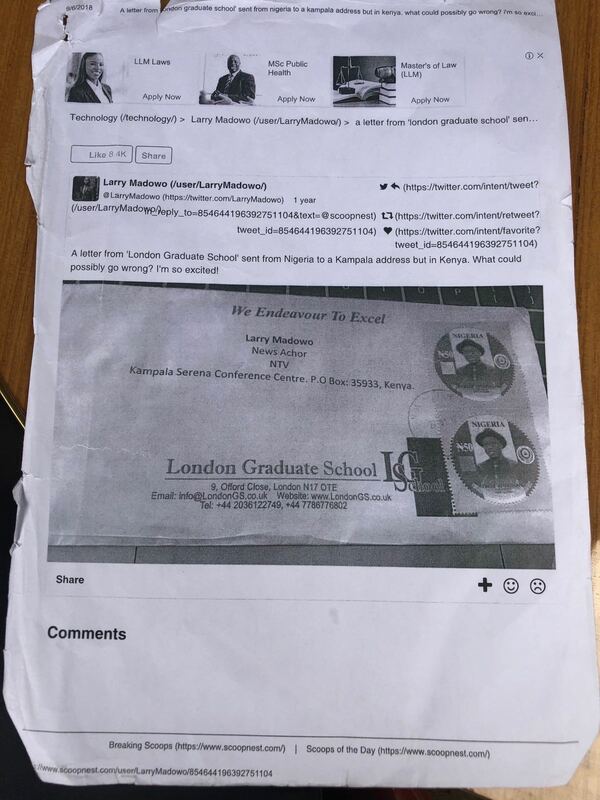 Others who have previously been lured by the fake university to obtain a degree from them are Larry Madowo and Boniface Mwangi who both shamed the mill online and never bothered to pursue it with them. With the above evidence, it’s clear that the Nairobi County Assembly representatives have a strong case against the speaker which the courts might just be used to sabotage.